My dad made this sundial. He was a wood pattern maker, and that’s an art and craft and profession that is slowly dying out. People now don’t know what a patter maker is, but they used to, back in a time when being able to make something wonderful and useful with your hands was considered more important than it seems to be now. When companies wanted to make an object out of metal, they would contract a pattern shop to make that object first out of wood. That required the reading of blueprints and a mind that could think in multiple dimensions, and a knowledge of many wood working machines as well as the wood itself. The pattern maker also had to make a core box, the reverse image of the pattern, (like the negative of a photo) to go along with the pattern. 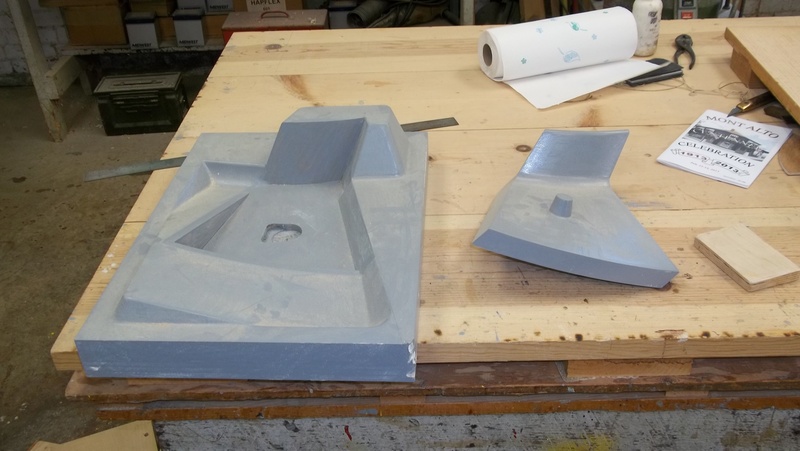 The core box was set up at the foundry with the pattern inside it, and special sand was poured into the core box and then hardened with heat. Once the pattern was removed, liquid metal could be poured into the sand core and left to harden, making the metal object that was needed to be created. That’s a quick description of how this all happens, but it’s all very technical and things need to be done exactly right. Patter makers had to undergo an apprenticeship that went on for several years to learn everything that is required. Some jobs were small; one man could handle the pattern and the core boxes, others were big and required two men. He once repaired the pattern for a crematory door that had been made incorrectly by another pattern shop, and he made some patterns for Jersey barriers to be used in a subway system, just to show you how many things used to require the skill of a pattern maker. He also made many patterns for large parts that went into machines that did all sorts of work in industries. Now many companies are having patterns made from fiberglass and some other materials, but there are still wood pattern shops that exist and are continuing to do business, just not very many. Here is a picture of a wood pattern and the core box to go with it. I have no idea what this object is. I took the picture at what was my father’s shop, the business he started and operated till his health required him to retire. He had trained an apprentice who then became a pattern maker and worked with him at the shop for many years, then bought the business and for many years has been a great family friend. Looking at any pattern that was ever being made at the shop showed what kind of intricate work it was, and how much knowledge and training were required to be good at this trade. 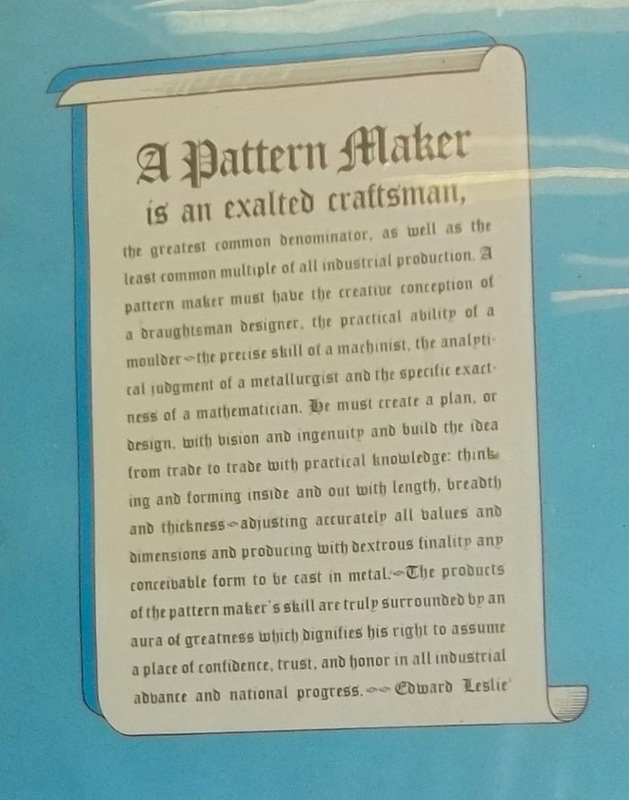 There was a sign that always hung in my dad’s shop, which explained how he and other pattern makers felt about their work, and how they wanted others to understand it as well. My dad was a woodworker in general and he built furniture for fun many times just because he enjoyed it or if there was a need for an item. Book cases, grandmother clocks, stools, and even birdhouses were among things he made at his shop when he wasn’t actually working at his trade. Once he decided to make a sundial, just because he knew he could, and because he wanted to learn the dynamics of where the numbers had to be placed to make the thing show the correct time. He could have just bought a sundial, but that wasn’t his way. He read about sundials (in actual books, many years before anyone had even thought of a thing called the internet) and learned how tall the arm had to be and how to space the numbers. He made a wood pattern of the face and the arm, made the core boxes, and got metal letters to attach to it to signify the hours and an arrow to point to the north. Then he took it to a foundry where someone would cast it for him, and he had a bronze sundial. He attached it to a bird bath pedestal with some kind of magic stuff that has made it stick for very many years now. It sits in my garden, among ferns and day lilies, and tells me the time when I’m out there working. 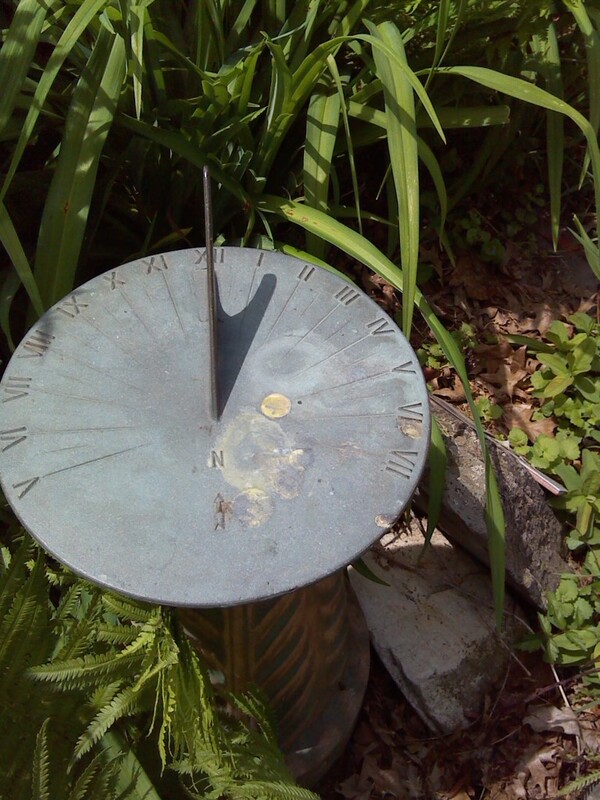 The oldest thing that exists to tell time does not concern itself with daylight savings time in my garden; it records the time of the earth and the sun, so in the summer my sundial is an hour behind. I could move it to make it correct with daylight savings time, but I prefer to remember I’m part of the earth when I’m working in the garden. The sun has told mankind the time forever. The arm of the sundial has to be the right height and length for the size of the face. The numbers have to be spaced exactly right. My dad got all those requirements exactly right. Most sundials have an arrow on the face which you need to point to the north when you set it up: true north, not magnetic north. The sundial must be level in both directions in order for the time to be correct. (Washing the bird dirt off of it for this picture might have disturbed the setting, and bird dirt is a part of nature too.) Sometimes it gets moved a little in the fall as I’m cleaning up things near where it is, dismantling tomato cages and the bamboo I use for more support for the tomatoes. Just a slight bump can knock it off level. So then in the spring I have to take the level out and fool with it a couple of times to get it just right again. It’s always a right of passage for me to welcome the spring…..time to go adjust the sundial. This very special sundial. ← Perspective and spring day musings……….. Thanks Herman. He was a man who needed to figure out how things worked. I got a lot of that from him, and I’ve benefited from that. Leveling, spacing the numbers just so, the arm a certain height- a very complex device for not having any moving parts or microchips. Thanks for sharing this piece of family history. Thanks Jackie. He was talented in so many ways. That’s the kind of things that Mikey was talking about, how so many things that our grandparents and great-grandparents knew how to do that have been lost in the age of technology. It’s really sad that there are so few true artisans left. I remember a dear old friend of the family when I was growing up that did the old-style typesetting with the individual lettering in the printing press. You just don’t hear about anyone knowing how to do those things anymore. There are now less than 1000 wood pattern makers left in the US. There used to be foundries in every town of any size and several pattern makers working in a shop associated with each foundry. Lots of the old stuff needs to be kept and it’s being lost. It’s so sad, these things will be gone forever. What a sweet tribute to your dad and his work Nancy! I’ve never heard of his profession, or at least that nomer “pattern maker”. Is that the same as a tool and die maker? I love your sundial…wish I had one too! No a tool and die maker is entirely different. This one sure is special to me. I started writing a blog about it and quickly realized the blog was getting to be more about the man who made it. Interesting. I too served a five year apprenticeship as a patternmaker, commencing in February 1946, I served a total of eight years with a mining company in Tasmania -(Australia), where the company had its own foundry. Wanting more experience, I served a further six years with International Harvester Company in Geelong Victoria -(Australia) and eventually returned to Tasmania and taught woodwork, metalwork and engineering drawing in Tasmanian High schools. Patternmaking is a most fascinating occupation, with the patterns ranging from small to large, and from simple to extremely intricate. I too made furniture, toys for my children etc. and eventually built my own home for retirement and saved myself a mortgage. I retired from teaching in december1990 and will be 88 in February 2017. Incidentally, whilst patternmakers may now be scarce in the so called developed countries, castings are still needed and this will always be so, but whilst big industries are more interested in greater profits, they have shipped off their industries to the so called developing countries where patterns and castings can be obtained at a far lower cost. Hence, and sadly, opportunities for our young people to gain employment in this most rewarding trade are almost non-existent. Thanks for visiting my blog Frank and for your wonderful comments. My friend who was my father’s apprentice and now owns the business is having less and less work and thinks he will close the shop in another year. He, like you, has had a long and rewarding life making a living using his hands to make things that people need. I hope you’re still able to do some things with wood now, since it is part of who you are. Be well and enjoy your retirement after a lifetime of good work. I’m sorry that he passed. There are not young pattern makers any more since it’s a dying art, and men aren’t being trained. Maybe your father had a copy of the piece about being an exalted craftsman.